Click here to get a visa to Australia. 2 October 2014 - Virgin Australia will start selling direct flights to Johannesburg from the 14th of October 2014. This comes after the airline struck a codeshare agreement with SAA. Virgin is essentially taking over the code sharing agreement that Qantas Airways had with South African Airways which they broke earlier in this year. Virgin previously sold JNB flights through their partner Singapore Airlines, the flight required a stop-over in Singapore which obviously lengthened the flight time quite considerably. This will be the first time in almost 4 years that Virgin Australia will be selling direct flights to Johannesburg. The airline started flying on the Melbourne-Johannesburg route in 2010 but ceased operations less than a year later after reporting heavy losses. V Australia operated flights non-stop from Melbourne to Johannesburg from the 13th March 2010, and announced on 26 August 2010 that it was axing the route from February 2011. The Boeing 777-300ER is inappropriate for a long remote ocean route where the big twin engine jet is restricted, for very very good reasons, to ETOPS 180 minutes rules - which meant the jet had to be flown for as much as three hours longer than a 4-engined jet (red line) to avoid the no-go zones shown in the map below. Newsflight : 6 February 2014 - Virgin Australia are returning to South Africa - well, at least in the form of a codeshare with SAA. You can now book flights on the Virgin Australia site from Melbourne, Adelaide and Brisbane to Johannesburg to Perth (Sydney has been left out, so as not to interfere with South African Airways' existing codeshare with Qantas). A bit of history. 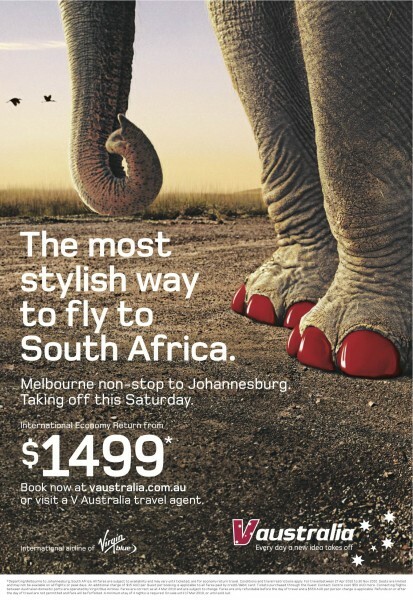 Virgin Australia launched Melbourne to Johannesburg flights from R7999 (return, including tax). They could be booked at www.vaustralia.co.za . Tickets purchased through the Guest Contact Centre cost $ZAR300 more. V Australia flights Australia to Johannesburg are subject to regulatory approval. All fares are subject to availability and may vary until ticketed. Seats are limited and may not be available at peak times or on all flights. Available only for instant purchase online. No stopovers are permitted. View our Types and Cabins page for V Promo, Premium Deal & Business Deal Sale Fare Rules. South Africa: Flights between South Africa and Australia are operated by V Australia Airlines. Connecting flights between Australian domestic ports are operated by Virgin Blue Airlines. Any Australian domestic travel can be booked through Virgin Blue.